Breaches, compliance and digital transformation are 3 challenges organizations today are faced with. The evolution of compliance mandates requires organizations to be nimble in aligning identity and data controls to meet these mandates. Organizations must also be adaptable to changing infrastructure due to successful digital transformation. Another issue at the center of today’s challenges is compromised identities. 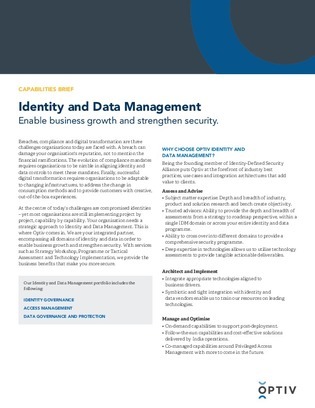 In this resource, learn why your organization needs a strategic approach to identity and data management. Also discover how Optiv can help strengthen your identity and data security.